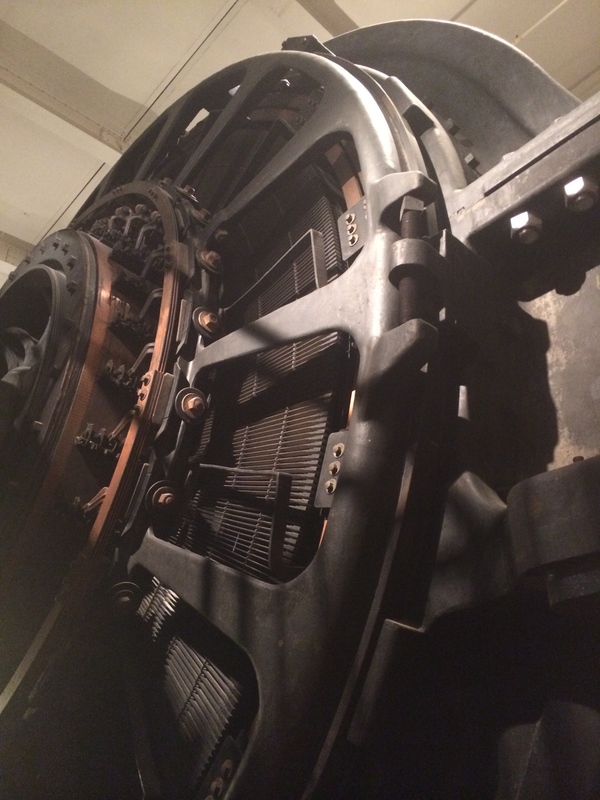 Our amazing industrial past is on display at the Henry Ford Museum. Here’s a piece of the massive Highland Park Engine, an electrical generator that powered Ford’s Model T factory. If you’re a Troubleshooter, I’ve discovered a destination that is worthy of a pilgrimage. This is a place where you can see the full panorama of the amazing (and recent) history of the industrial revolution. Yet at the same time, this site is NOW, showing you the state-of-the-art in manufacturing. Combined, it’s our technological past and present, which will also inspire visions of the future, all in one afternoon. I’m talking about the Henry Ford Museum and the Dearborn Truck Plant, which I visited on a recent trip to Detroit. A classy engine: check out those arches. Like a geologist looking at rock strata and seeing back into time, I had a similar experience perusing the machines on display at the Henry Ford Museum. Take the museum’s collection of steam engines as an example: you get a sense of how progress is both revolutionary and evolutionary. 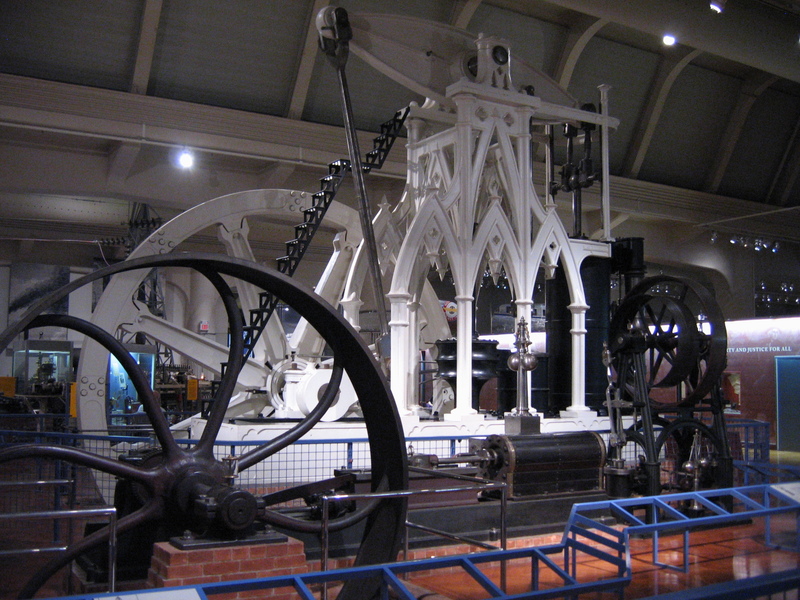 The invention of the steam engine was, by itself, a giant leap forward. However, that basic design was then subjected to thousands of innovations, both large and small, as it was made more efficient and useful. Those changes allowed steam technology to take on a wide variety of roles in factories, railroads, at sea, and for the generation of electricity. The Henry Ford’s amazing collection of cars, airplanes, trains, and agricultural equipment inspires similar comparisons across time: it was interesting to see how each machine evolved to serve an ever-changing workload and the tastes of consumers (the aesthetic transformation of the automobile is especially interesting). 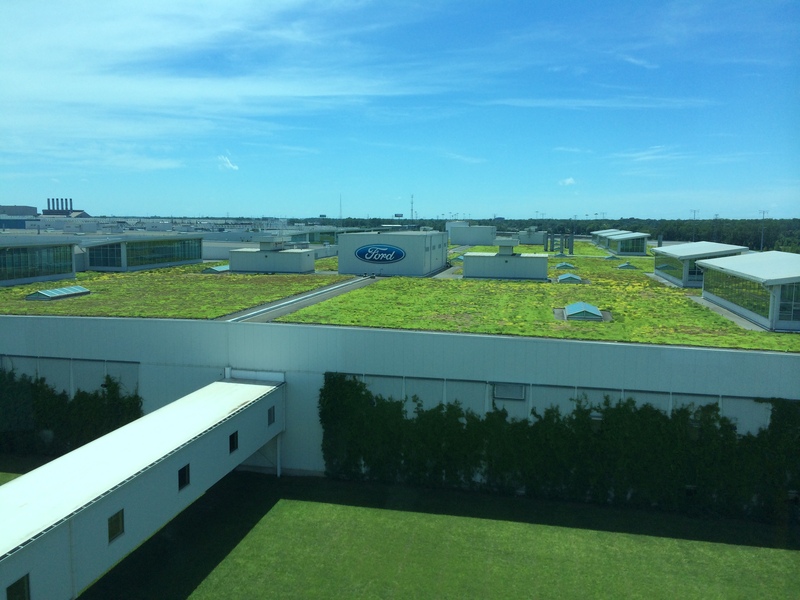 A “living roof” tops the final assembly building of Ford’s Dearborn Truck Plant. At the Ford Rouge Factory assembly line, this key economic principle is on display in an obvious and visually apparent manner—seeing it in action before your eyes is way better than any textbook description. The day I visited, they were building the F-150 pickup truck and the factory was buzzing with the activity of hundreds of workers. The number of steps required to build a pickup truck is astonishing. Looking at one on the street, you get the sense there must be a lot of work required, but seeing it being built within the context of a huge factory gives you a new appreciation of the complexity involved. That realization slowly sets in as you stroll along the 1/3-mile elevated walkway that rings the final assembly area: a beautifully choreographed dance of machines and people unfolds before your eyes. Depending on where you turn your head, you get little visual slices of a truck’s progress as it goes from a pile of parts to a fully built machine: the windshield is glued into place, speakers are installed in the doors, the dashboard is lifted into position, the truck’s bed is attached to the back, etc. And, this is just the “final assembly,” the end of a very long chain of production. What you don’t see is the work that goes into creating and gathering all the inputs needed to make an F-150; that takes place in hundreds of other factories, many on-site in Ford’s sprawling 1,100-acre facilities in Dearborn, Michigan. The guide said that most people take 2 hours to see the factory facilities, but I was so fascinated by what I saw that I spent almost 4 hours. The flow of the assembly line is hypnotic: I would take long pauses to observe just a single operation, repeated over and over by the workers. It was easy to get lulled into a trance and then wonder “How long have I been standing here…watching them install windshields?” The workers don’t seem to mind the audience: they’re much too busy keeping up with the healthy pace of the assembly line that turns out about one truck per minute. Watching the construction of the F-150 brought to mind what I’ve written about the relationship of troubleshooting to manufacturing (see “Repair or Replace?” for the full discussion). In the course of fixing something, you will often retread the same steps that were done at the factory. Both the factory worker and the mechanic in the field are using the same mental model of what an F-150 should be. The factory worker labors to instantiate this archetype into the physical realm for the first time, while the mechanic attempts to bring a broken vehicle back to this ideal form. Along the way, the factory worker and the troubleshooter may perform roughly the same steps. However, the assembly line has many advantages over the lone Troubleshooter, and the division of labor is just the tip of the iceberg. Within a well-tuned factory you have the confluence of both expertise and material resources: that is, tools and parts plus the know-how of what to do with them at every stage of the process chain. Watching these assembly line workers do a particular job repeatedly, you can easily see how each one will become an expert at their assigned operation. Not only that, but they have the correct tools and the required parts within arm’s reach. As I would pause and observe a worker performing a job, I would imagine that same truck in the possession of its owner, and what it would be like if the part that was being installed were to fail and need to be replaced. At the factory, the first-time installation of a part is relatively easy (at least compared to replacing it out in the field). We’ve already discussed how the division of labor encourages expertise among the installers, but the advantage doesn’t end there. The build of a new truck is done in a very specific order, using the guiding principle of inside-to-outside. You would never consider installing the electronic lock system, located in the interior of a door, after all the door finishes (fabric, handles, etc.) had been applied! No, this is much better accomplished when the door is just a shell, wide open, and easily accessible. So, the factory workers have another huge advantage over the troubleshooter as well: each of their work steps is done when it’s the most convenient. Conversely, on a finished truck, a failing part may be very difficult to reach. The troubleshooter doesn’t get to take advantage of the open and orderly build process used in the factory. Fixing that electronic lock system may first require complete disassembly of the door for it to become accessible. Plus, after that repair is complete, then reassembly must occur, a doubling of the labor performed at the factory. Finally, the troubleshooter doesn’t get to choose what is broken, and is expected to be able to find and correct the fault anywhere it lies within a machine (a generalist mentality that contrasts with the specialization of the assembly line). Because the cost of replacement is always a competitor to his actions, a troubleshooter’s only hope for being economically efficient is to use a small fraction of the labor and parts that were originally used at the factory. Repair actions tend to be less efficient: hour-for-hour your labor will accomplish less versus the assembly line worker, and the same goes for other resources (factories buy their parts in bulk and reap savings there too). These are all points I’ve covered elsewhere in greater detail, but they become obvious in new ways when you see the assembly line in live action. Torque: the tool knows which operation is being performed and selects the desired tightening force, delivering the exact amount required for a particular fastener. Completeness: if a particular installation requires that 5 screws be driven, the tool keeps track of the progress towards that goal, alerting workers if a step was missed. Correctness: automated measurement of the tightening angle can detect missing washers or incorrectly threaded bolts. Statistics on tightening information can also be gathered and compared to the current fastening, which is especially important for the installation of safety-related parts (like a bolt holding an anchor point of a seatbelt). Feedback/ergonomics: some of the tools have cameras attached to them for the installation of parts in difficult-to-see areas. Others give feedback on the correct selection of parts or guide the user to where an operation should be performed. These “smart tools,” combined with smart workers, make the Dearborn factory floor a pretty calm place. First off, the soundscape is unexpectedly muted: the electric tools are much quieter than the pneumatic ones they replaced. It’s no monastery, with plenty of interesting noises, but the signs indicated that most of the workstations no longer require hearing protection. There was also a good “flow” to the operation, with workers easily moving in and out of a vehicle as it passed by them. The line moves at a decent pace but no one seemed rushed, completing their work in a serene manner and sometimes pausing to chat between vehicles. I’m inferring, but it must be nice to know that you can concentrate on your work and the automated QC built into the tools will kick in if something doesn’t go right. I always felt better about my job if I knew that I wasn’t the last line of defense: that kind of pressure can be focusing, but it can also be fatiguing as well. Above certain stations on the assembly line there were signs that said “Top 20 Warranty Issue CTQ.” CTQ is a Six Sigma concept concerning “the internal critical quality parameters that relate to the wants and needs of the customer.” I’m assuming that these were steps in the manufacturing process that had been identified as leading to problems after the vehicle was in use. This is often something that a company “knows” (i.e., it’s in a spreadsheet somewhere) but fails to act upon. Therefore, it was really great to see that this kind of defect information was being pushed all the way back to the front-line workers and made part of their awareness. When a truck body enters the building, the doors are separated and undergo their own build in a parallel assembly line. Everything is tracked electronically so that the doors and body can be reunited later on in the process. Removing the doors improves the efficiency of the entire assembly process: if they were attached, they would get in the way of all the work that needs to be done within the interior of the truck. Automated QC robots with laser beams attached to them checked the gap distances between the doors and the body as the finished truck rolled off the line. On the factory tour, I learned something about persistence that will definitely stick with me: Ford Motor Company was actually the 3rd car company that Henry Ford started. That’s right, his first 2 automobile ventures, the Detroit Automobile Company and the Henry Ford Company, ended in failure. Think about that the next time you want to give up. Nice post, Jason. Factory tours of all kinds are fascinating. I have taken trips around North America in my RV with itineraries based on factory tours. My wife and I have seen autos and trucks being built, produce being processed and packed, candy making, cheese making, jackets being sewn, flowers being grown commercially, logs being sawn for lumber, and all kinds of other manufacturing processes. It is amazing and eye-opening to watch and wonder. Your observations about the nexus between manufacturing and troubleshooting are interesting and useful to think about. A simple part replacement on our cars is always a bigger deal than we often assume, if you think about the whole scheme of a car’s life cycle. Thank you for your work. Thanks, Lawrence! I’m definitely going to add more factory tours to my travel routine: they are fascinating and a great way to gain understanding about a new place. Thanks for a fascinating post. The photos could have done with something to give an idea of scale. One can guess the scale of the Gothic arches (by the stair way) but not so obvious in the Highland Park Engine. Keep these blogs coming! The scale of the Highland Park Power Plant Engines? See my photo I link to at the end. My grandfather was the draftsman to the man that designed those engines. He started working for Edward Gray in Oil City at Riverside Engine Company. Gray sold Ford his first power plant , a 1,500 HP engine that quickly was inadequate as Ford was building more and more cars per day. The next was a 5,000 HP ‘gas-steam’ engine, the forerunner to the nine 6,000 HP ‘gas-steam’ engines that would fill the Highland Park Power Plant building directly on Woodward Avenue- Ford after all was a showman! Thanks for the links to your pictures of the Highland Park Engine—it’s definitely a highlight of any trip to the Henry Ford Museum!